You might not know this, but BioShock's Rapture actually exists. Objects have been salvaged from the underwater city and are now available for sale. The National Entertainment Collectibles Association announced the release of two BioShock 2 collectibles this week. The first is a Big Daddy Bouncer plush doll, a replica of the type carried around by the Little Sisters in BioShock 2. 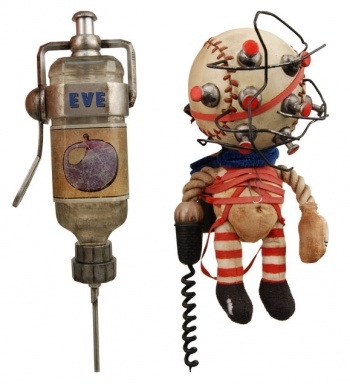 The second is an Eve Hypo, used in BioShock 2 to restore the player's EVE capacity. The Big Daddy doll is perfect for transforming your daughter into a Little Sister, or your little sister into a Little Sister. It features a baseball as a head, a corkscrew arm, and is 7 inches tall. Unless you actually are a Big Daddy though, it would probably just creep out your kids if you gave it to them. The EVE Hypo is a little more interactive. It's 8 inches tall, looks appropriately weathered, and has LED lights inside that make it glow blue when a button is pressed. Be warned, if the authorities catch you with it, they will arrest you. The two props join the Big Daddy Bouncer and Big Sister Figurines announced in late 2009, and were perhaps inspired by the fan made ADAM syringe from the original BioShock. They don't quite compare to having a full-size replica Big Daddy, but they'll bring you a step or two closer to living in Rapture while staying above sea level. The next prop I want to see made from BioShock is a replica set of Andrew Ryan golf clubs, with bloodstains included. The EVE Hypo and Big Daddy plush can be purchased on Amazon.com.